Eventually I did get around to buying it, though, and you know what? I couldn’t be happier that my fears have turned out to be completely unfounded. Spelunky HD looks amazing, has superb controller controls (to the point where I actually prefer to use it over the keyboard) and is in all other respects almost a one-to-one update of its predecessor1. You’re an Indiana Jones-esque explorer – although one of the new features is that there’s new characters you can unlock, they all have identical abilities to the original Fedora man – and your goal is to descend to the bottom of a series of randomly-generated yet themed caves. You start with a whip, a limited supply of grappling hooks which can be used to reach high-up ledges, and a similarly limited supply of bombs to blast through walls and (if you’re good enough) kill tough baddies; more bombs and ropes can be picked up in the dungeon or bought from shops which are periodically scattered throughout the levels, while you can also acquire or buy a dizzying array of other items and weapons to aid you in your run, and yet your basic repertoire of moves remains very, very basic: at the start of the game you can run, jump and whip, and that’s it. 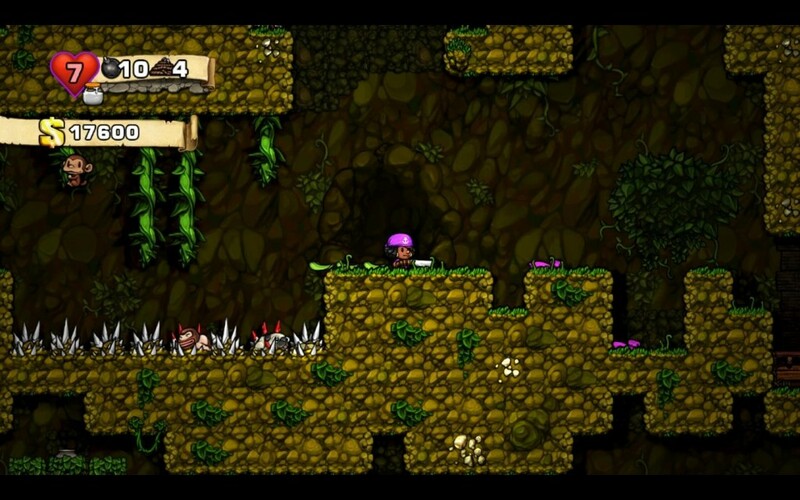 From this inauspicious beginning Spelunky expects you to surmount hordes of vicious monsters, devious deathtraps and angry gods, and despite this being a rather daunting task it also expects you to enjoy it. What I’ve just described is a roguelike, yet while Spelunky does share much in common with roguelikes I think that it puts a sufficiently original spin on the concept that it sits a little bit apart from roguelikes in general. 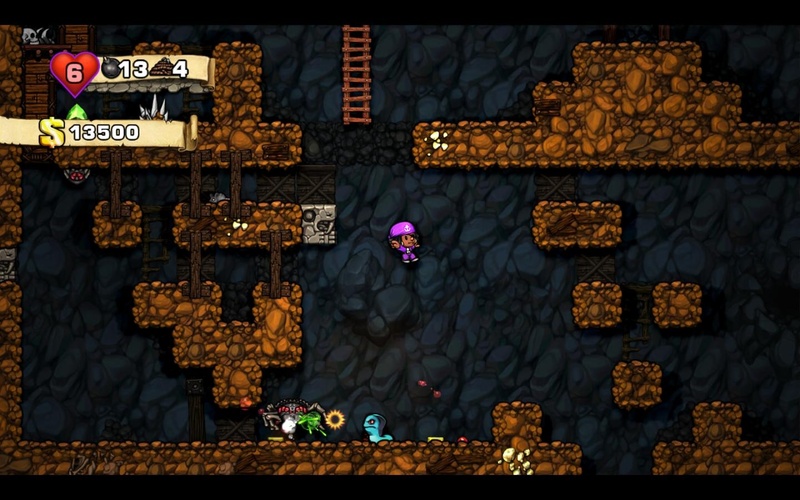 What I like about Spelunky is that while it certainly has the depth of roguelikes, it (rather uniquely in my experience) also has a lot of breadth. There’s no experience points and no grinding, any special abilities your character has are dictated by their items rather than their class, and it’s at least theoretically possible for you to complete the game on your very first run. This gives Spelunky a flexibility that I think is missing from the majority of other roguelikes, and one which is aided by its length: it takes about forty minutes to get to the bottom of the dungeon . This means that on any particular runthrough you’re only going to see a fraction of Spelunky’s content, but because there’s just so much of it you can guarantee that you’re never going to get the same run twice. And apart from the secret levels which require some puzzle solving (or looking up the secret on the internet) in order to access them, you can see pretty much any of this content from minute one. This flexibility makes Spelunky incredibly good at what it does: it’s a half-hour game that pretty much defines “Easy to learn, hard to master,” and which will take hundreds of runs in order to master it. Its breadth means it never gets repetitive, while its depth and its learning curve keep you hooked in and coming back for more since you start to visibly improve at the game after just a few runs. Despite it being a truly unforgiving game in the best tradition of roguelikes (there are several traps and enemies which will instantly kill you from full health if you blunder into them), Spelunky also adds the neat twist that after you have the basic mechanics of the game down the thing that ends up killing you most of the time is overconfidence. 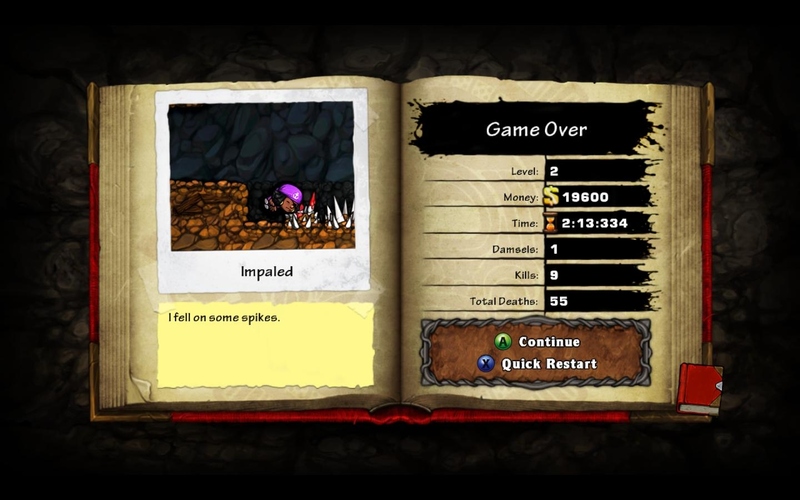 It’s not the dungeon that kills you in Spelunky, it’s your own stupid mistakes. Because it’s player error rather than the game environment dicking you over2 there’s always the feeling that you could do it better, that you could get it right next time if you just took another swing at it. This is where Spelunky’s longevity comes from; this is why so many people have played the thing hundreds of times without ever getting bored or fed up. It’s a fantastic strength to have, and one which Spelunky makes full use of. Another clever thing Spelunky does (or rather does not do) is that it never contradicts its own internal logic. It has some irrational and sometimes downright finicky rules, but having established them – and having forced the player to learn them – it will always stick to them, never doing that infuriating game thing where it’s one rule for the player and another for the enemies. Take spikes, for example. While you can walk past a set of spikes with impunity, jumping on spikes from any height, even if its a standing knee-high jump, will instantly kill the player stone cold dead. This ensures that you treat spikes with respect, but they can be incredibly useful because the exact same rule applies to the monsters and enemies inhabiting the dungeon: if you can lure them onto the spikes they’ll also be insta-killed – even the giant spiders which would usually take ten whip-strikes to kill normally. Then there’s the damsels, which now come in Male, Female and Dog varieties. If you can find a damsel and carry them to the level exit point you get an extra heart added to your health counter. Damsels are the only way to get extra health in Spelunky, and transporting them from their hiding spot (which often requires you to bomb through a wall) to the exit can be a pain when you can only carry one non-clothing item at a time; if you want to keep that handy-dandy shotgun that’s been keeping you alive up until this point you’r going to have to either come back for it later or figure out a way to ferry both to the exit in shifts. However, while you might be forced to drop your weapon you’re not completely defenceless, since once they’ve been picked up damsels function just like any other carryable object, which amongst other things means they can be used as projectile weapons by throwing them at the monsters. Only the toughest baddies will survive being struck by a damsel moving on a high-speed ballistic trajectory. 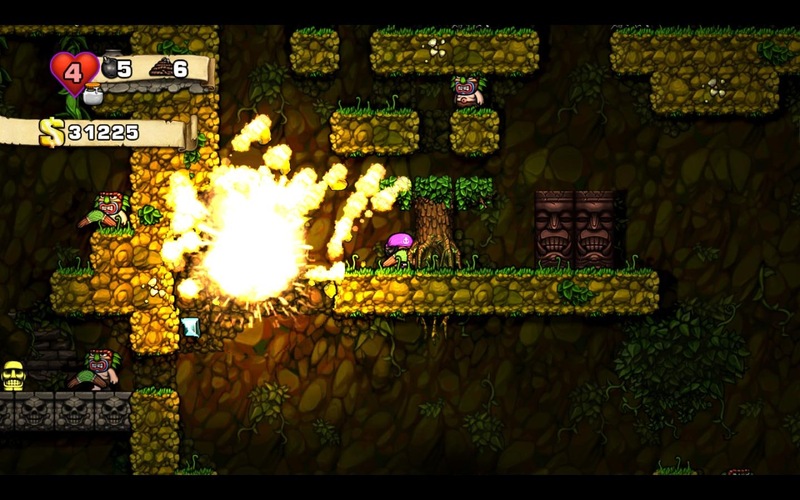 It’s another example of Spelunky establishing a rule – thrown objects will damage anything they hit, including yourself if you’re unlucky enough to bounce one off a wall and back into your own face – and carrying it through to its logical conclusion with no caveats or exceptions. It’s this approach to a consistent ruleset which I find more compelling than anything else about the game. For once I don’t have to figure out the unique game logic governing a new item or enemy and how it interacts with the unique game logic governing every other item or enemy. Instead I just have to learn the basic rules of the game and where the item fits into those, and because it relies on a overall system rather than rules for individual instances Spelunky can often react to what you do in emergent yet predictable ways. When you get hit by a spider that knocks you off a ledge and into the path of an arrow trap that propels you onto some spikes it’s not some unusual combination of rules for spiders + rules for arrows + rules for spikes, it’s simply one system that’s working precisely as intended and which can and will produce the same result if you set it up again. It’s an approach to game design that I’ve always thought should be more popular than it actually is, and Spelunky executes it flawlessly. Aside from a very small number of occasions (usually just after picking up a new item you’ve never seen before) you will never go to your death wondering what the hell just happened. You will be able to figure it out based on nothing more than the rules of the system, and then use that knowledge to better avoid it next time. This approach to systems and learning figures into that roguelike learning curve I mentioned earlier; because it’s so disarmingly simple Spelunky is genuinely easy to learn. It is the least daunting and intimidating roguelike I’ve ever played whilst being as unforgiving as the best of them, and it’s all wrapped up in top-notch presentation with controls that are better than ever. I think the only complaint I can make about it is the music; it’s not bad as such, it’s just rather bland and lacks the chiptune charm of the original’s soundtrack. (I don’t know what it would have cost to either hire the same guy or licence his music again, but it would have been worth it.) That being said there is a lot more of it, and since Spelunky HD is a game I can easily see myself sinking dozens of hours into it’s important that it not become too repetitive. It’s not a game I’d play for more than half an hour at a time, but as a short activity to fill in the gaps between other, more demanding games I’m fairly sure Spelunky has no peer. It’s just excellent in nearly every single way that matters, and there’s far too few games I can truly say that about these days. Probably worth mentioning the Steam integration as well – the daily challenges (a run which is identical for everyone, which you can only have one go at) and the general leaderboards make a big difference to me. I made the mistake of buying the DRM-free GOG version because it was cheaper, and although the meat of the game is still there, the social aspects are the icing (this metaphor isn’t going very well) which really makes it. I saved up my pennies from selling hats and trading cards and bought it on Steam. Don’t regret it. It’s definitely worth the extra few quid, but I wouldn’t consider it a major selling point unless you’re really competitive and also have a lot of friends who own the game on Steam. I mean, I’m the most competitive man in existence and I’ve been mostly disinterested in the leaderboards except for the daily challenge. I did not realize you were very competitive! Maybe you should clarify why the leaderboards hold so little interest for you, particularly since it seems that this could determine where someone purchases the title.. Admittedly what I mostly care about is the dailies, and the little community that’s built up around discussing and comparing your runs afterwards, with narrated videos and all sorts. It’s a lovely idea. Literally the first question I ask about any game I play is “How do I win?” But the issue with the Spelunky leaderboards is that the metrics used for winning make no sense: they rank players on based on money acquired rather than distance travelled, which means a player who gets $20,000 on level 1 and then falls onto some spikes will be ranked higher than a player who beats Olmec but spent all their money on bombs. Now, the community that has built up *around* the Daily Challenge that Janek mentions is interesting, and perhaps if Spelunky HD had some sort of replay functionality so that you could easily compare and contrast your runs with your friends it would be a hell of a lot more compelling. Unfortunately the only way to do this right now is to record yourself in Fraps and upload the video in Youtube. So while the Daily Challenge is a nice idea, and a good way of focusing a player’s attention (I only do one or two runs per day, and one of those might as well be the Daily Challenge since it is interesting knowing that everyone else will have to surmount exactly the same challenges), it falls some way short in terms of execution. This reminds me of the inverse of one of the big complaints of the Devil May Cry reboot (which I recommend, by the way). The complaint was that it was too easy to get high ratings for combos, making the in-game scoring easier and less meaningful. Here, though, the game uses a metric that doesn’t necessarily correlate with success, so rather than inflating scores, you are rewarding–to some degree–dumb luck. Hmm. Maybe creating several leaderboards tracking money, time, etc. and then a sort of meta-leaderboard tracking overall performance in all of the others would create a more valid system. I’m not sure it’s a perfect solution, but I think success in this type of game is hard to quantify. The most logical solution would be simply to do the leaderboards based on how far you get, then by how much gold you’ve got. The other problem is that if you rate it on distance travelled you have to remember you’re dealing with a game that can be speed-run in less than eight minutes. However, this would still be very reliant on a player knowing what they’re doing, and so it’d still be a better success metric than money. Basing it around money forces you to play in a very weird kind of way, where you don’t buy any of the good items and make yourself that much less likely to reach the end of the game — but hey, at least your money total is high, right? Long story short, I think level as the coarse-grain measure of progression and then money as fine-grain would be the best way of doing it. Instead it’s the other way around. Very strange.